The SGD 70-A DK+ is the development kit for the 7” PanelPilotACE compatible display, SGD 70-A. 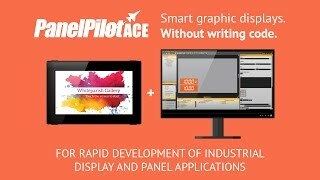 The development board itself allows users to quickly connect to and test all of the input and output functionality of the PanelPilotACE display. The kit includes a development board, an SGD 70-A PanelPilotACE display, a USB cable and a power supply. The development board includes LEDs and switches for digital I/O’s, four potentiometers to generate analogue inputs, variable brightness LEDs for PWM outputs and a prototyping area for testing circuitry. Connections are also available for the display’s RS232, RS485, SPI and I²C functionality. The PanelPilotACE University has a multitude of resources to make your programming experience as quick and efficient as possible. From How To Guides and Frequently Asked Questions to an ever growing number of pre-configured ACE Templates and an Icon and Graphic Library, visit the University and make your PanelPilotACE project even quicker. 5 to 30 V d.c.
PanelPilotACE Design Studio provides a number of building blocks which allow users to drag-and-drop elements onto the screen to quickly create advanced user interfaces.